THEN 50% of the revenue was invested in greening the bar. The campaign was organized by Students-in-Free-Enterprise (SIFE). 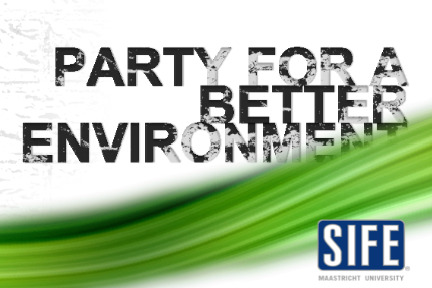 The Drink Green Party series is part of SIFE. Its mission is to make students and pub owners aware of their impact on the environment and how they can party for the environment. We offered to several pubs throughout the city our mob: around 200 students who would join the party. In exchange, pub owners had to give us their % of revenue they would make with the party to invest in greening their own bar. Cafe van Bommel offered 50%. SIFE Drink Green Event series made it possible to make the Cafe van Bommel the first pub that is greened by its customers! As promised 50% of the revenue had been green-invested into the pub. The money was used to install new equipment like energy efficient LED light bulbs. Annually, 8200 kWh of energy will be saved which is equivalent to ca 4.32tons of CO2! That's as much as a new 1.2 TDI BlueMotion VW Polo would emit over 49,655km.